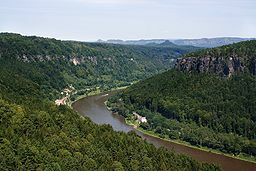 The Elbe (Czech: Labe (help·info); German: Elbe; Law German: Elv) is ane o the major rivers o Central Europe. It rises in the Krkonoše Muntains o the northren Czech Republic afore traversin much o Bohemie (Czech Republic), then Germany an flowin intae the North Sea at Cuxhaven, 110 km (68 mi) northwest o Hamburg. Its tot length is 1,094 kilometres (680 mi). 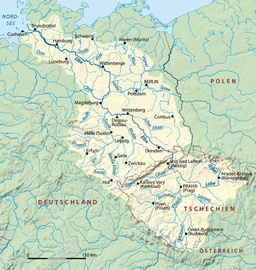 The Elbe's major tributaries include the Vltava, Saale, Havel, Mulde, Schwarze Elster, an Ohře rivers. 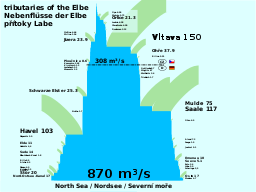 ↑ 1.0 1.1 "Elbe River basin". International Commission for the Protection of the Elbe River. Retrieved 2009-02-04. This page wis last eeditit on 3 Mairch 2018, at 23:35.